Clusterbean (Cyamopsis tetragonoloba L. Taub), is an important industrial, vegetable and forage crop. This crop owes its commercial importance to the presence of guar gum (galactomannans) in its endosperm which is used as a lubricant in a range of industries. Despite its relevance to agriculture and industry, genomic resources available in this crop are limited. Therefore, the present study was undertaken to generate RNA-Seq based transcriptome from leaf, shoot, and flower tissues. A total of 145 million high quality Illumina reads were assembled using Trinity into 127,706 transcripts and 48,007 non-redundant high quality (HQ) unigenes. We annotated 79% unigenes against Plant Genes from the National Center for Biotechnology Information (NCBI), Swiss-Prot, Pfam, gene ontology (GO) and KEGG databases. Among the annotated unigenes, 30,020 were assigned with 116,964 GO terms, 9984 with EC and 6111 with 137 KEGG pathways. At different fragments per kilobase of transcript per millions fragments sequenced (FPKM) levels, genes were found expressed higher in flower tissue followed by shoot and leaf. Additionally, we identified 8687 potential simple sequence repeats (SSRs) with an average frequency of one SSR per 8.75 kb. A total of 28 amplified SSRs in 21 clusterbean genotypes resulted in polymorphism in 13 markers with average polymorphic information content (PIC) of 0.21. We also constructed a database named ‘ClustergeneDB’ for easy retrieval of unigenes and the microsatellite markers. 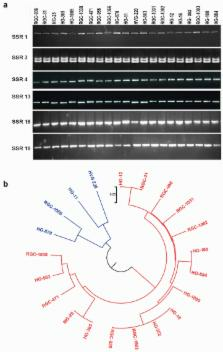 The tissue specific genes identified and the molecular marker resources developed in this study is expected to aid in genetic improvement of clusterbean for its end use. Motivation: Although many next-generation sequencing (NGS) read preprocessing tools already existed, we could not find any tool or combination of tools that met our requirements in terms of flexibility, correct handling of paired-end data and high performance. We have developed Trimmomatic as a more flexible and efficient preprocessing tool, which could correctly handle paired-end data. Results: The value of NGS read preprocessing is demonstrated for both reference-based and reference-free tasks. Trimmomatic is shown to produce output that is at least competitive with, and in many cases superior to, that produced by other tools, in all scenarios tested. Availability and implementation: Trimmomatic is licensed under GPL V3. It is cross-platform (Java 1.5+ required) and available at http://www.usadellab.org/cms/index.php?page=trimmomatic Contact: usadel@bio1.rwth-aachen.de Supplementary information: Supplementary data are available at Bioinformatics online. Current address: National Agri-Food Biotechnology Institute, Mohali 140306, India. Copyright statement: © 2017 by the authors. [Analysis of microsatellite loci from Bactrocera dorsalis based on transcriptome dataset].